The daily time report fits again on one page. The content size has been amended. Fixed rounding error in indicating the overtime within the overtime report. The setup is now going to install the needed Microsoft .NET Framework 4.5.2 automatically. The TimePunch attendance list has been adapted to the latest version 1.8. One can now logon by entering the given name and surename, and does not need to know the internal user ID. The Version 1.8 of our TimePunch Application Server, which is the time tracking on your server, has been adapted to the new functions in TimePunch v2.8. New: The setup is now going to install the needed Microsoft .NET Framework 4.5.2 automatically. The TimePunch Application Server has now the ability to talk with a SMTP Server in order to allow modules in TimePunch the implementation of email workflows. The application server settings have been revised. It can be used to set an Internet proxy and the system language which is used for automated email updates. In the current release the report filter for the employee groups is no longer working. This issue is addressed by the fix. 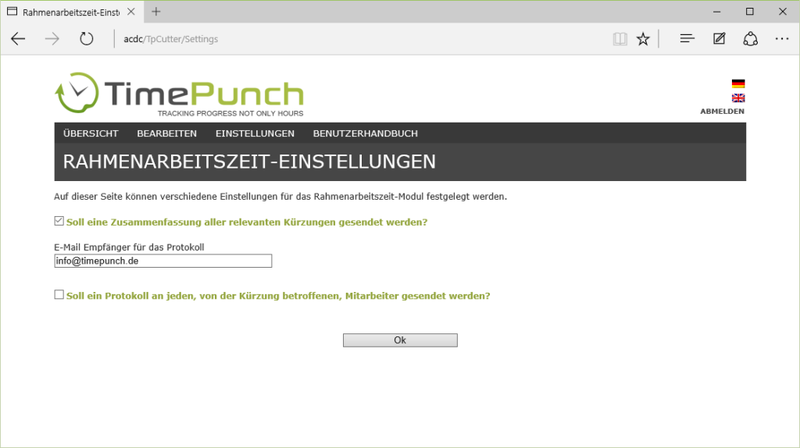 The TimePunch Cutter Release v1.8 uses the new possibilities of the TimePunch Application Server. A summary of the cuts to an individual administrator can be sent on request. In addition, each employee who is affected by the cuts, can receive an email of the relevant changes. 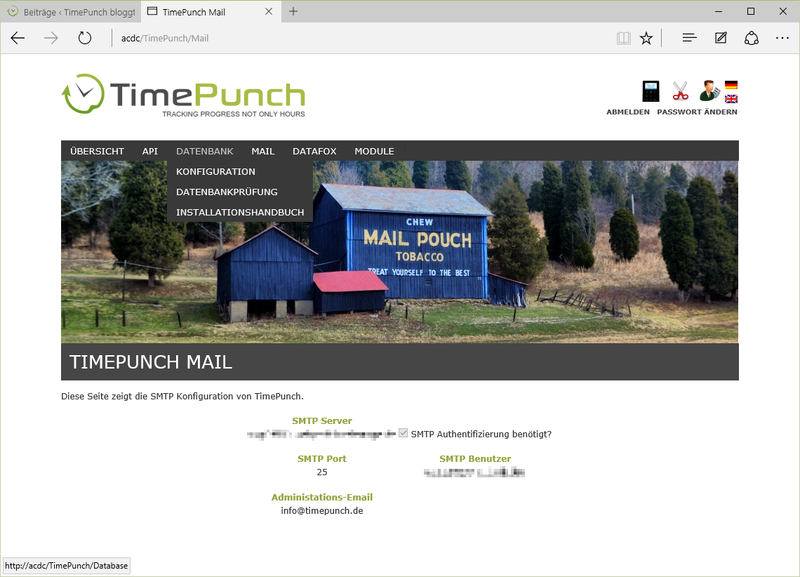 We are pleased to announce the beta version of TimePunch 2.8. This version contains many new features regarding the user friendlyness. Info: We recommend making a month-end closing and a database backup before the migration. In the dialog box to edit an entry, the day of the week now appears when selecting a date. The time format 0830 for 8:30 is now also accepted as 8:30 am or 8.5 or 8:30. This makes the input of the time very flexible. The edit time entry dialog will now open via the Enter key. The entry is saved directly by the return. The mouse is not required thus maximally. When creating a several-day entry from morning until noon (the same day) the pause time has been added incorrectly. That’s fixed now. A mode to move the time entry can now be enabled in the dialog when editing the time entry. If moves are activated the time entry by selecting a new date on this day. In previous versions, the entry had to be deleted and re-created again. A click to a calendar day did not update the analyse window in Version 2.7. This bug has now been fixed in the current Version. TimePunch customer data have a unique key which is composed from “Customer ID” and “Name of the customer”. In the previous version, the “customer ID” and “Name” had to match import so that the data is updated. This prevents the changing of the name, or enforces a new customer to be created. In the current version also customer number and name from existing customers can be updated by the import. Only then colour mark the specific occasion of the absence in the calendar when the employee which is viewed, is associated with the employee logged-in to ensure the privacy of employees. This applies to disease, special leave, leave and flextime. In case that the employee is not a supervisor, the times only apppear as “Absent”. The some rounding errors in the overtime report have been corrected. The dialog to manage the TimePunch PRO licenses has been made more easy to use. The dialog to manage the TimePunch ONE license has been made more easy to use. 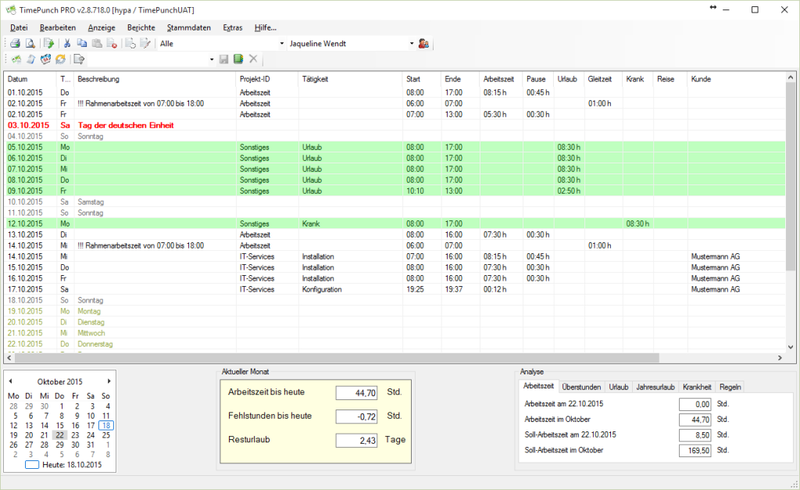 The month-end closing can be performed now for multiple employees directly from the TimePunch client. TimePunch of profiles is no longer necessary as of version 2.8. To facilitate the payroll, the non-working days because of public holidays are included in the monthly report. In germany, these must be paid the workers with the full salary. A time entry receives a new field “onsite” in this version. Thus, services rendered can be marked and thus separately billed. FS#472 – Determine duration of work as the length of a day. Now it can be defined in the working time model, what fraction of the day are the working hours in relation to a full day’s work. This has for example impact on the holiday. e.g. for a 4 hour day and a defined length by 1/2 day, the employee vaction reduces by max 4 hours, or a 1/2 day. Attention: Because of this change it is no longer possible to over book holidays! This may cause a correction of the vacation account and overtime account. We recommend making a month-end closing before the migration. The dialog for entering the working time models has been greatly simplified. It must no longer be chosen between the pure working time or start and end times. Both models are combined. Als the rarely to never used advanced pause time are history. If those times are required, then this can be mapped over the working-time frame model. It is now possible to define a cost factor for a task. The hourly rate is then multiplied by the cost factor to obtain the total cost. Thus, for example can be settled better on weekends or overtime. Copied time entries are pasted on the selected day, and no longer, as in the previous version, after the last time entry. For security reasons only human resources managers or administrators have the right to open blocked months in order to make changes. TimePunch allows to create now a half-day holidays. Such holidays halve the planned time of the employee on the day. The introduction was intendend for companies that give the employees a half day (at own cost) e.g. Christmas or new year’s Eve.